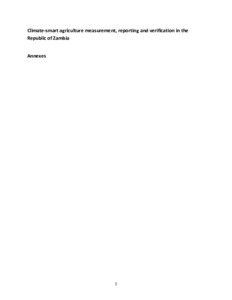 Annexes for the Climate-smart agriculture measurement, reporting and verification in the Republic of Zambia report. World Agroforestry Centre, Unique Forestry and Land Use. 2019. Climate-smart agriculture measurement, reporting and verification in the Republic of Zambia. Annexes.